This is a growing list of useful learning space resources we’re gathering. Let us know if you have resources we should add here. Space for Learning – UK – This website is for all those who plan, design, fund, manage, resource, programme and develop learning spaces within museums, galleries and built and natural heritage sites. Here you’ll find a checklist with a comprehensive list of questions you can use to shape the planning for your learning space. You can also find case studies and filter by budget, project scope, and more. Humber College in Toronto, Canada – Explore this project website dedicated to their large campus redesign project. AV Cost Survey from Educause listserv members – Charts with the results from the informal AV costs survey Sept 2018. 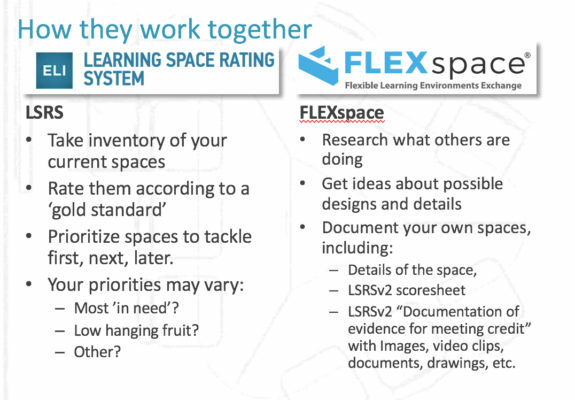 FLEXspace is thrilled to collaborate with the ELI Learning Space Rating System (LSRS) initiative. Each FLEXspace record contains a field where the LSRS score may be entered. This year, progress continues around the alignment of the FLEXspace and LSRS initiatives. provide a guide to adapting existing spaces to institutional need. “The Learning Space Rating System (LSRS) provides institutions with a measure of how the planning, design, and support of their learning spaces encourage active learning. The LSRS Team intends the system to assess the potential of physical environments to enable a spectrum of active teaching and learning engagements. The rating system enables institutions not only to examine the effectiveness of their own facilities but also to benchmark their environments against best practices within the higher education community, and thereby enable all to advocate for more effective learning spaces.” …Read more About the LSRS at EDUCAUSE.org. The UK Higher Education Learning Spaces ToolkitThe UK HE Learning Space Toolkit has been produced by SCHOMS, AUDE and UCISA to help members from all three professional bodies share best practice and work more effectively when creating learning spaces. We would like to thank the numerous colleagues from across the professional associations, and others within the wider higher education community, who have contributed to the production of this Toolkit by sharing their experiences and reviewing content. We hope this Toolkit will serve both as a practical guide and as a source of inspiration in the design of spaces that delight and motivate students, as well as they meet their functional needs. Guidelines for Learning Spaces – The Center for Learning and Teaching at the University of Michigan has an excellent guide to designing campus learning spaces. National Clearinghouse for Educational Facilities – Unfortunately, the NCEF is no longer funded, but its website archives a variety of resources on learning spaces and facilities. Drawn from NCEF’s vast database of 19,000 records, subject-specific resource lists provide a quick path to 167 school facilities topics. Each continuously updated list includes descriptions of books, studies, reports, and journal articles, with links to online publications and related websites. Learning Spaces Collaboratory – The LSC strives to “translate findings from contemporary research and practice in the field into roadmaps for shaping and assessing built environments for learning in the undergraduate setting.” Check out their website for quarterly roundtable discussions, webinars, and research reports. The National Survey for Student Engagement (NSSE) is a respected indicator of student engagement used by over 1450 universities across North America. Their Engagement Indicator themes and High-Impact Practices (2013) are based upon extensive educational research. JISC Learning Spaces Guide. This resource is provided by the Joint Information Systems Committee (JISC), a UK-based organization supporting education and research. This is a guide with associated case studies and a photo library on new build and refurbishment in the sectors including sustainable approaches and business incubation spaces. UK Higher Education Learning Space Toolkit: Case studies Inspiration and lessons learned from recent learning space projects and a model to follow in evaluating your own learning spaces and planning new developments. The Importance of Physical Space in Creating Supportive Learning Environments A special issue of New Directions for Teaching and Learning published in Winter 2002. Learning Spaces, an Educause eBook In addition to the e-book’s core chapters on learning space design principles (chapters 1–13) , this site also offers case studies illustrating those principles (chapters 15–43), including links to examples of innovative learning spaces. In Sync: Environmental Behavior Research and the Design of Learning Spaces by Lennie Scott-Webber, Society of College and University Planning, 2004. Here are some other organizations, resources, and initiatives for improving learning spaces. EDUCAUSE’s Learning Space Resources – EDUCAUSE is an association focused on technology in higher education, and they offer a variety of resources on learning space design. The Learning Space Toolkit. Contains resources for planning, assessing and supporting learning spaces. ISTE – International Society for Technology in Education See the ISTE Learning Spaces Network Mission: The Learning Spaces Network promotes the gathering and sharing of information, research and ideas related to learning space design principles. The network offers: resources and research on best practices in learning space design, a community of practice related to design thinking and innovative learning spaces, and outreach and advocacy to raise awareness about the importance of space for learning. Consortium of College and University Media CentersThe Consortium of College and University Media Centers (CCUMC) provides sound leadership and a forum for information exchange. Our nearly 800 members are at the forefront of media and technology support for quality teaching and learning in higher education settings. We are proud to include members from all sizes of post-secondary institutions as well as private enterprises that supply the media and instructional technology products. Council for Adult and Experiential LearningThe leader in linking learning and work, the 501(c)(3) nonprofit Council for Adult and Experiential Learning (CAEL) pursues work at all levels within the public and private sectors to enhance learning opportunities for adults around the world. The Innovative Learning Environments and Teacher Change (ILETC) project is an Australian Research Council (ARC) Linkage Project funded for 4 years from 2016-2019. It brings together the expertise of leading researchers in education and learning environments and partner organisations in education and learning environment design and technology.